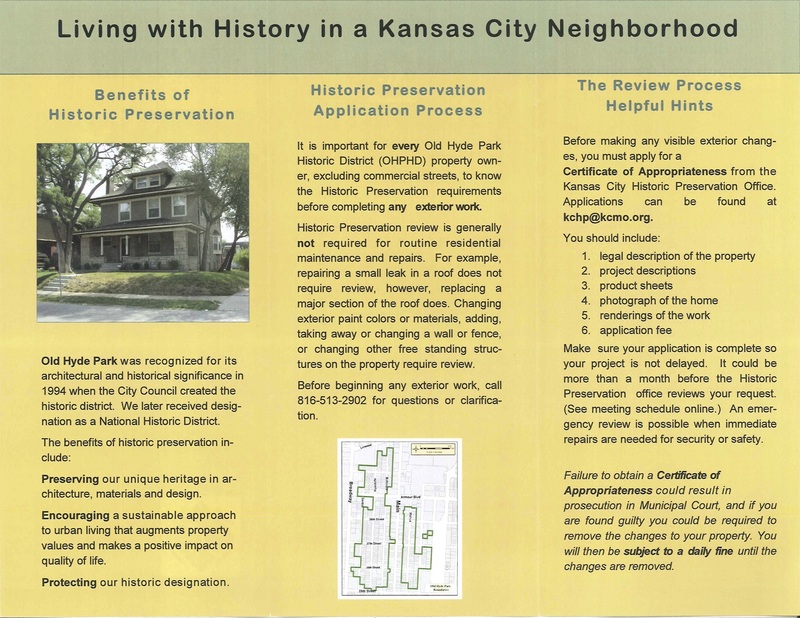 This project sought to address the challenge posed to owners of homes in Kansas City's historic district, who must submit a Certificate of Appropriateness to the KCMO Historic Preservation Office before making visible changes to their property. Failure to obtain approval in some cases may result in comply with guidelines and penalties, New owner of property in OHPHD were often not informed of historic requirements, and neighbors were sometimes blamed for not warning them prior to making changes to their property. The last OHPHD brochure was produced in 2000, and it contains no information on these requirements. The OHPHD Board of Directors has agreed that a new brochure was necessary to promote the beautiful but under-appreciated OHPHD and to inform new residents of their responsibilities and requirements of living in this historic district in midtown KC. The brochure committee had conducted several meetings to develop the content of the brochure and the funding provided by the Community Capital fund was applied to the production of a Welcome Brochure. Old Hyde Park Historic District Inc.